During our 28 years together, Lara and I have assembled an art collection that makes our house feel like a home. Each piece is a time machine, transporting us back to some magical point in our life together, making it ever-present. There are molas that Lara bought while visiting her friend Anita in Panama, alpaca weavings I picked up in Peru during a visit to Machu Picchu, and a wonderful kinetic sculpture I admired while we vacationed in New England and that Lara stealthily managed to buy and give to me for Christmas a few months later. An alpaca weaving that I acquired during a trip to Machu Picchu in Peru. But there’s one piece that ranks among my favorites. It’s not the most valuable. Or even the most stunning. But it was our first purchased together, and it serves as a constant reminder of the early years in our marriage. 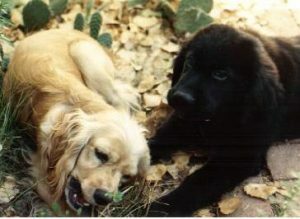 Crystal and PigPen in our back yard in Albuquerque. While Lara and I were living in Albuquerque, Mom and Pops came out to visit. They stayed with us in our newly acquired house in the student ghetto across from the University of New Mexico, and we already were completely smitten with the mystical, high-desert vibe that permeated everything. We struggled to buy that house. We were turned down by numerous mortgage lenders and when we thought we were about to lose it, we managed to close the deal. It was ours, even if we didn’t have much to furnish it with. On the night we closed, Lara insisted on staying in the house, even though there were no beds. So she and I made a nest of blankets in the living room while Crystal, our cocker spaniel puppy, and PigPen, our lab pup, scurried around trying to make sense of the new environs. 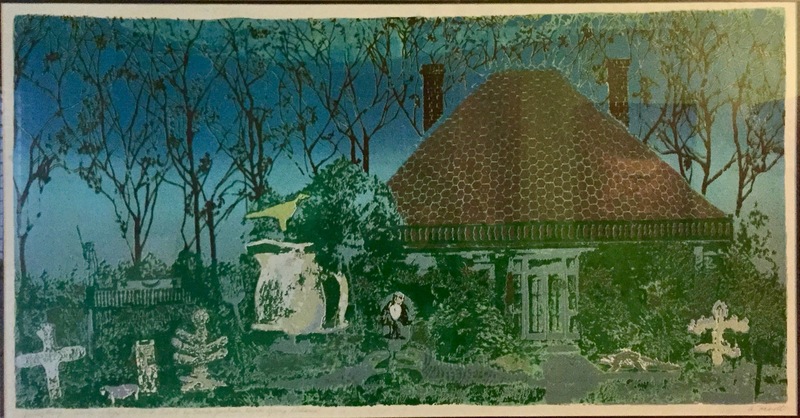 Anton Haardt’s print of a garden in Montgomery, Alabama, that our dear friend Boogie gave us when we got married in August 1989. Mom and Pops arrived to find the house was mostly empty. The walls were bare. Some basic furniture had been added. But it still was a work in progress. 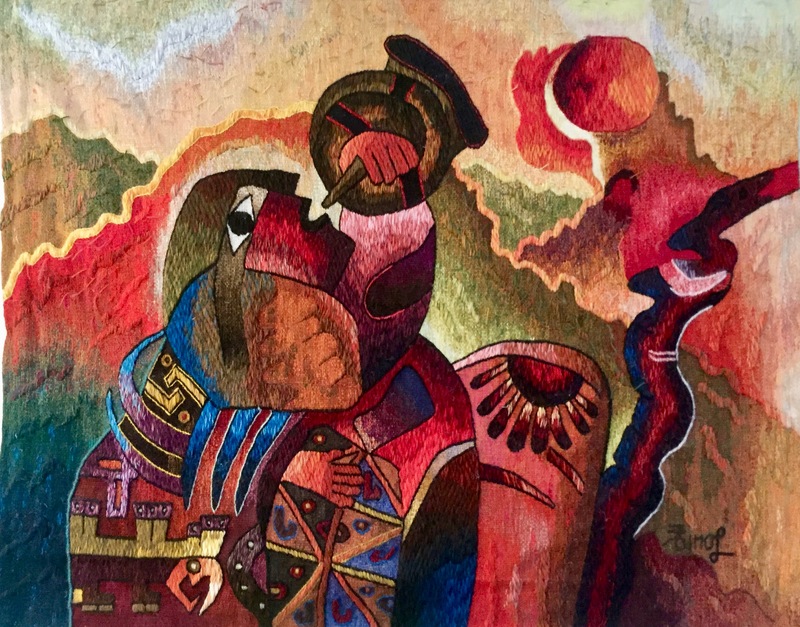 The only thing we had to hang on the walls was a wonderful Anton Haardt print that our dear friend Lynn “Boogie” Rawlins had purchased for us as a wedding present. 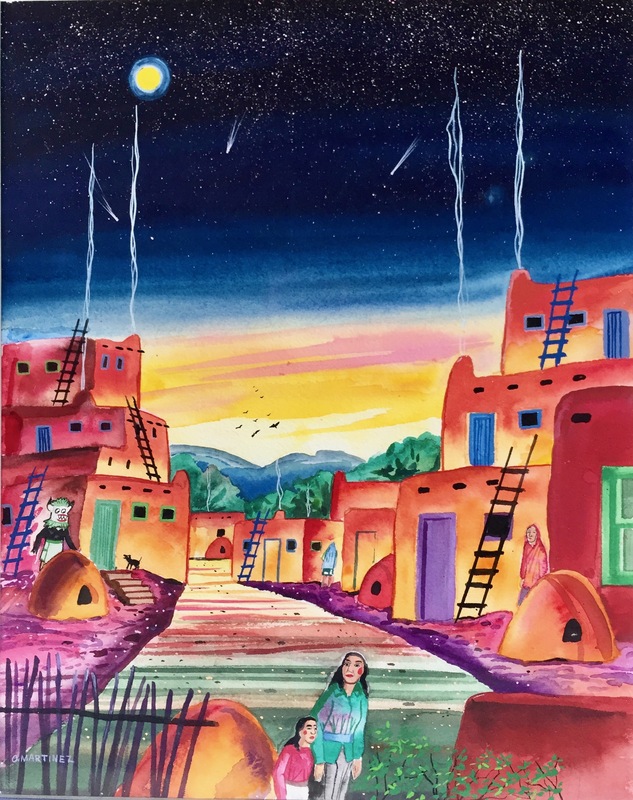 We put my parents through all the tourist paces, including trips to the Jemez Mountains (still among my favorite places on the planet), Sandia Peak and Albuquerque’s Old Town, where we kicked around in the second-hand stores and galleries, pining for the beautiful art that evoked the landscape around us. 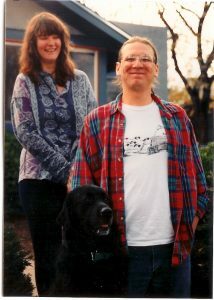 Lara, PigPen and me standing proudly in front of our house in the student ghetto circa 1990. That’s when Mom said she and Pops wanted to buy a piece of art for us. Even at that early stage, Mom sensed art would become an indispensable part of our lives together. Lara and I cycled through several galleries, trying to find the perfect piece, the piece that would be the foundation of an art collection we’re still assembling today. It wasn’t the most spectacular work we looked at that day. It definitely wasn’t the most expensive. My mind has been eroded by time and decades in the newspaper industry, but I seem to recall we paid about $100 for it. A staggering sum for us at a time when a $67,000 house in the student ghetto had sucked every bit of our financial resources to secure. That piece is a marvelous watercolor by O. Martinez. It’s not technically brilliant. But it really speaks to that time, that moment in our marriage when everything was new and shiny and packed with potential. The sky is infinite and bristling with stars. The moon is in full flail. Comets trail earthward while piñon smoke rises to the heavens. A woman and girl (mother and daughter?) walk through the streets. The approach of Mother’s Day got me thinking about that painting. My niece, Heather, just purchased her first house and went through a process that was as frustrating and rewarding as Lara and I endured almost 30 years ago. As I started thinking about a house-warming gift, I recalled how much Heather loved art and how proud she was when she purchased a Van Gough-inspired piece in D.C. while she was visiting us there. So I’m going to try to give Heather and her partner, Nick, a gift as enduring and beautiful as the one Mom gave us all those years ago. Instead of an appliance or piece of furniture, I’m asking these new homeowners to find a piece of art that speaks to them and means as much to them as that painting Mom and Pops bought us as we were starting out. 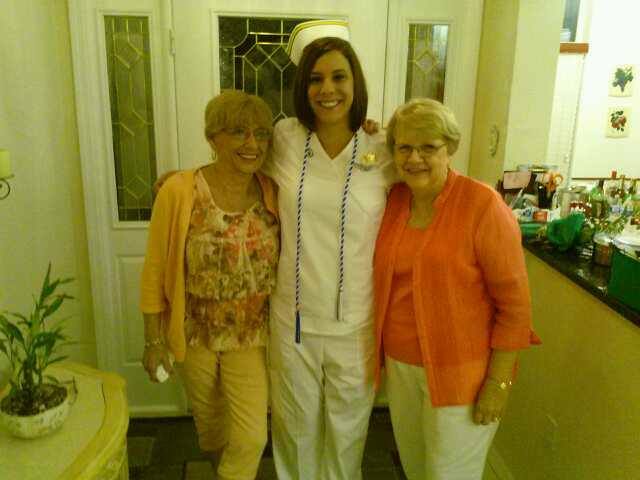 Heather with her two grandmothers, Glowie on the left, Mom on the right. This seems an appropriate tribute to Mom on this Mother’s Day. I’m carrying on a tradition of great gifts that she instilled in me (there was nothing more magical than coming downstairs on Christmas morning after Mom and Pops had pulled out all the stops to make the holiday perfect). 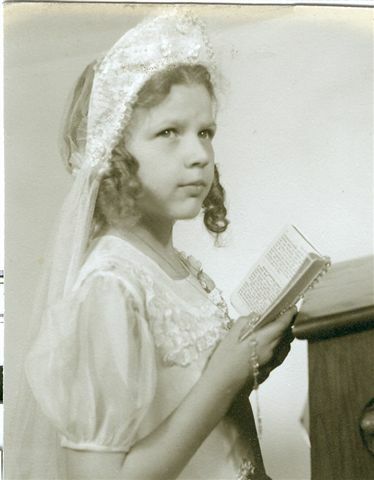 Mom endured my turbulent, sullen teen years, serving hot breakfasts even when I’d stubbornly refused, preferring instead to feast on adolescent rage. Mom made sure I went to college. Even if it involved a hard shove to get me out the door and heading toward Edinboro. 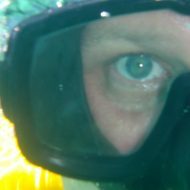 Mom stood behind me when I did things that were inexplicable to her, like moving to the Florida Everglades right out of college or traveling to strange, foreign places. In short, Mom’s always been there for me. And if things ever unraveled, I know I could show up at her door and be taken in. What she and Pops did to help Heather get her nursing degree was amazing. She just keeps giving. Thanks, Mom. Know that I love you always and am forever thankful for the foundation you gave me. 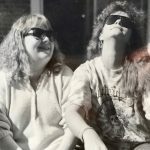 Thirty years later, I remain married to my best friend, live in a town I love and am thoroughly enjoying life. I couldn’t have done that without you. 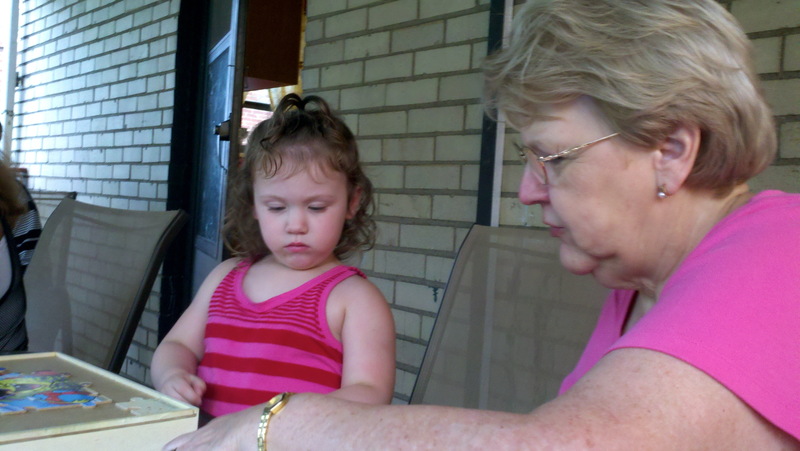 Mom with her great-granddaughter, Mercedes. 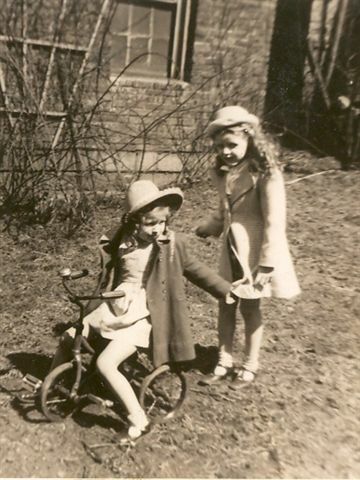 Mom and little sister, Joanne, in the back yard of my grandparents house in North Braddock, Pa. 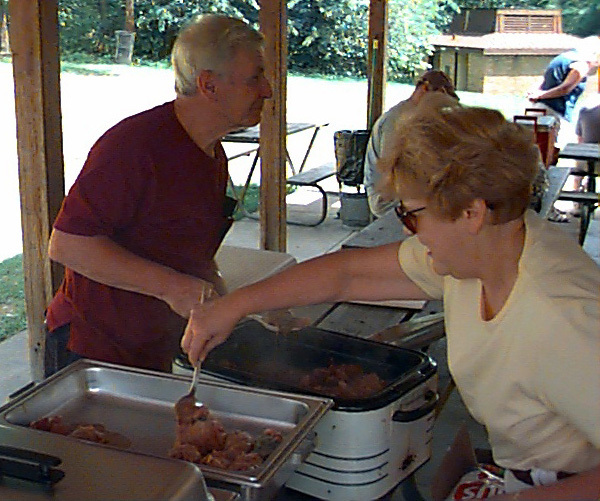 Mom and Pops serve up stuffed cabbages (aka Hunky hand grenades) at a family reunion several years ago. Great write Bob. You have an amazing way with words. Please tell your mom and dad hi from me the next time you speak with them. Bob you never cease to amaze me with your written words. Not only do you bring a story to life but you make the reader feel like they are standing right there next to you in all your adventures. God bless both you and your beautiful wife and thank you for letting me be a part of the Robert Benz experience . Great to hear from you, Shawn. I’ll definitely give the family your regards. Hope all’s going well with you. Beautiful tribute to your mom Bob….these words will be a lasting gift to your mom and I am sure she will treasure them. I couldn’t have wanted a better gift. So many times in the years raising you boys, I felt like such an inadequate mother. Your words mean the world to me and make me feel that with all my doubts, I must have done something right in raising you and your brothers. Thank you for this wonderful gift.